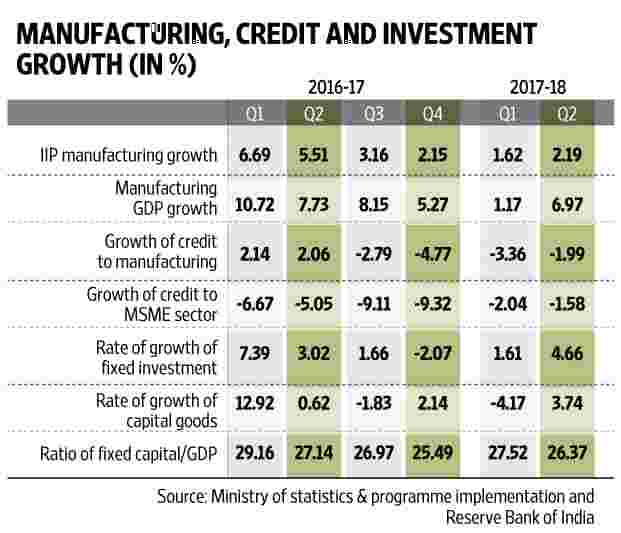 The table shows falling manufacturing GDP growth, the anaemic status of credit growth to manufacturing and micro, small and medium enterprises (MSMEs), poor rate of growth in fixed investments and rate of growth of capital goods and the falling ratio of fixed capital to GDP. But banks’ investment in government securities grew 15% in the past four quarters. Banks are reluctant to offer credit for industrial activity, reasons for which are widely known. The current reported data on investments is also not encouraging. Data from the Centre for Monitoring Indian Economy (CMIE) shows a significant reduction in new investment proposals in April-December 2017. Hence we may see some brown-field expansion in manufacturing in 2018-19, but few fresh investments. Productivity growth of manufacturing has been moderate and sticky. Average productivity growth of organized manufacturing during 2010-13 was around 1.8%. The total factor productivity growth of manufacturing in the corporate sector is a little higher, but it exhibits similar stickiness. Total factor productivity growth in some key sectors such as basic metals and non-metallic minerals was negative. Though other general measures on labour, land and infrastructure could improve total factor productivity somewhat, sector-specific factors are required to be analysed for taking necessary policy measures to take productivity growth in manufacturing to a higher level. Industry associations and executives have been suggesting the need for policy interventions by the government to improve manufacturing prospects. From building skills among the large population of minimally educated workforce, enacting laws that focus on improving workforce relations together with greater flexibility, improving infrastructure including development of world class clusters, reducing uncertainties and providing stability and predictability in regulatory, legal, environmental, taxation areas and providing access to capital at competitive prices have been many of the suggestions that have been offered at different fora. Some initiatives have been taken in recent past, but they need focused implementation. An already conceived programme on silicon manufacturing for fabrication must be revived. This will ensure competitive domestic production of chips, leading to a reduction in imports of electronic items that has been increasing, as well as improve security. Electric vehicles are an area where evolution of technologies gives us options and public investment in this area should not restrict choice. The model standing orders need to be replaced by guidelines, allowing industries themselves to frame their specific standing orders. The multiplicity of unions wastes productive management time; we should see how its beneficial effects can be captured in other ways. The global economy is witnessing a revival. The US, Europe, China, Japan and South-East Asian economies are exhibiting growth. The exports to these countries would help in improving capacity utilization and a restart of the investment cycle. The procedure in goods and services tax (GST) refunds for input tax credit and other processes by Directorate General of Foreign Trade (DGFT) in exports could be allowed on a self-certification basis to reduce the liquidity crunch. Banks should reassess working capital requirements for exports and meet them on a priority. Items for which merchandise export incentive scheme (MEIS) was not granted so far may be revisited and attention may be focused on assistance to states for export-related infrastructure through assistance to states for development of export infrastructure and allied activities (ASIDE) type schemes, financial and technical assistance to export industries to improve their standards and application of trade defence measures wherever permitted. The inverted duty structure must be attended to and negotiations of items getting hit under current free trade agreements (FTAs) should be focused upon. The insolvency and bankruptcy code’s (IBC) implementation will be watched by both banks and the industry alike to draw lessons for their future behaviour. We have decided to recapitalize public sector banks. Once we get an idea of the extent of recovery in some sectors after studying IBC results, the government and the Reserve Bank of India (RBI) can assess further capital requirement. The government, however, must state now itself that on consideration of such requirement, the necessary recapitalization amount will be provided. The autonomy of bank management, enhancement of banks’ professional capabilities, increased use of technology to reduce costs, improved whistle blower system and getting government equity holding below 50% are other necessary measures for confidence-building for lending. The MSMEs’ financing has suffered. Structures within banks must be regrouped to create specialization at zonal or regional level for appraisal and grant of loans to this sector. Branches will then monitor only the performance of these loans. An increased use of ratings, credit insurance, and reasonable choice by creditor committees in the IBC proceedings for MSMEs are necessary. There are reasons why factoring has not taken off and efforts must be made to fix the problem. Other intentions such as self-certification and steps for seamless graduation must be implemented. R. Gopalan and M.C. Singhi are, respectively, former secretary and senior adviser at the department of economic affairs.